This is the documentation for the mxODBC package used in the mxODBC Connect Server. A PDF version is available for printing and offline use. mxODBC has proven to be the most stable and versatile ODBC interface available for Python. It has been in active use for years and is actively maintained by eGenix.com to meet the requirements of modern database applications which our customers have built on top of mxODBC. This manual will give you an in-depth overview of mxODBC's capabilities and features. It is written as technical manual, so background in Python and database programming is needed. mxODBC tries to hide many of the complicated details of the ODBC specification from the user, but does provide access to many of the introspection APIs defined in that standard. If you don't need introspection for your applications, you can easily make use of mxODBC without any further knowledge of the underlying ODBC interface. 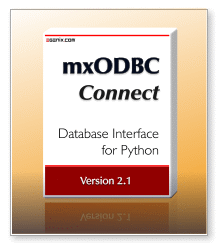 The mxODBC package provides a PythonDatabase API 2.0 compliant interface to databases that are accessible via the ODBC application programming interface (API). Since ODBC is the de-facto standard for connecting to databases, this allows connecting Python to most available databases on the market today. Accessing the databases can either be done through an ODBC manager, e.g. the ODBC manager that comes with Windows, iODBC or unixODBC which are free ODBC managers available for Unix, or directly by linking to the database ODBC drivers. The package supports parallel database interfacing meaning that you can access multiple different databases from within one process, e.g. one database through the iODBC manager and another through unixODBC. Included are several preconfigured subpackages for a wide range of common ODBC drivers and managers to support this. mxODBC uses the mxDateTime package for handling date/time value, eliminating the problems you normally face when handling dates before 1.1.1970 and after 2038. This also makes the package Year 2000/2038 safe. The mxODBC database package is distributed as add-on for the eGenix.com mx Base Distribution (egenix-mx-base). Please visit the eGenix.com web-site to download the latest versions of both the eGenix.com mx Base Distribution and the eGenix.com mxODBC distribution for your platform and Python version. Before installing the egenix-mxodbc package, you will have to install the egenix-mx-base distribution which contains packages needed by mxODBC. Even though both distributions use the same installation procedure, please refer to the egenix-mx-base installation instructions on how to install that package. The binaries provided by eGenix.com for use on Windows only include the mx.ODBC.Windows subpackage of mxODBC. This subpackage interfaces directly to the Microsoft ODBC Manager, so you can use all available Windows system tools to configure your ODBC data sources. If you get an import error, please visit the eGenix.com web-site and install the egenix-mx-base package first. ● You will need ODBC drivers for all database you wish to connect to. Windows comes with a very complete set of such drivers, but if you can't find the driver you are looking for have a look at section 13 Hints & Links to other Resources. After you have downloaded the Windows installer of the egenix-mxodbc distribution, double-click on the .exe file to start the installer. Depending on your Python installation, you may need admin privileges on Windows NT, 2000, XP and Vista to successfully complete the installation. The installer will then ask you to accept the license, choose the Python version and then to start the install process. If the listbox showing the installed Python versions is empty, it is likely that you have chosen the wrong Windows installer for your Python version. Please go back to the eGenix.com web-site and download the correct version for the installed Python version. In case you are upgrading to a new mxODBC version, the installer will ask you whether you want to overwrite existing files. Answer "yes" to this question. It is safe to allow the installer overwrite files. The installer will then install all the needed files. Note that it does not setup any links on the desktop or in the start menu. To uninstall the distribution, run the Windows Software Setup tool and select the "Python x.x eGenix mxODBC x.x" entry for deinstallation. This will uninstall all files that can safely be removed from the system. It will not remove files which were added to the subpackages after installation. On Linux you can use the binary RPM packages provided by eGenix.com to simplify the install process. These binaries only include the mx.ODBC.iODBC andmx.ODBC.unixODBC subpackages of mxODBC. These two subpackage interface directly to the iODBC or unixODBC ODBC managers, one of which is usually preinstalled on Linux systems. You can use the available GUI-configuration helpers for these ODBC managers to configure your ODBC data sources. ● You will need ODBC drivers for all database you wish to connect to. If you can't find the driver you are looking for have a look at section 13 Hints & Links to other Resources. The RPM files provided by eGenix.com include the subpackages for the iODBC and unixODBC ODBC managers. This will install the package even though only one of the subpackages mx.ODBC.iODBC or mx.ODBC.unixODBC will actually work. You get an ImportError for the subpackage which has the unresolved dependencies. This section describes installation of mxODBC from source. This is usually only necessary on platforms for which eGenix.com does not provide binary packages or if you have special needs. The procedure is the same for Windows and Unix. ● Also make sure that you have the Python development files installed on your system: these are usually located in /usr/local/lib/pythonX.X/config/ or /usr/lib/pythonX.X/config/. If you don't, look for a python-devel or similar package for your OS distribution and install this first. ● A C compiler is required. GNU CC (gcc) will do in most cases on Unix, but it is advised to use the same C compiler and linker that you have used to compile Python itself on the target platform. The installation process will automatically choose the compiler depending on the Python installation for you. On Windows, Visual C++is preferred, but cygwin or mingw32 should also work. To install mxODBC on a non-Linux Unix platform such as Sun Solaris, AIX or BSD, download the source distribution of the egenix-mxodbc distribution, e.g. egenix-mxodbc-3.0.0.zip. Unzip this source archive to a temporary directory and change into the distribution directory (e.g. egenix-mxodbc-3.0.0/). Depending on your Python installation, you may need root privileges on Unix to successfully complete the installation. To install the egenix-mxodbc distribution, run the setup.py script with the Python version you want to install the packages to, e.g. This automatically scans the system for available ODBC drivers and managers and try to build all subpackages for which it finds the right libraries and header files. If the automatic setup does not find the ODBC you have installed on the system, please use your favorite Python editor and edit the file mxODBC.py according to the instructions given in that file. You should normally only have to adapt the paths given in the different subpackages setup sections to your actual ODBC driver install paths. to the setup lines in mxODBC.py and reinstall. You can rerun the above install command as often as you like until the compile and install process works as configured. However, if you change a configuration setting, please make sure that the build/ subdirectory of the distribution directory is being removed prior to executing the install. Otherwise, the installation process could pick up files from a previous run and not use the modified settings. mxODBC provides a way of accessing the ODBC API of ODBC managers and drivers. In order to connect to a database you still need to have suitable ODBC drivers installed on the machine where you are running the Python application. ● If you are running a 64-bit Python application, you will also have to have a 64-bit ODBC manager and ODBC driver installed. ● If you are running a 32-bit Python application, you need an 32-bit ODBC manager and ODBC driver. Note that the ODBC manager may be capable of translating 32-bit or 64-bit function calls to whatever the ODBC driver supports (this is called thunking). Please check the documentation of your ODBC manager for details. Most database ship with ODBC drivers for Windows, so setting up database access for Python applications on Windows is fairly straight forward. Once you've installed the ODBC drivers on the machine you are running your Python application on, you will need to setup an ODBC Data Source. This can be done using the ODBC Manager on Windows. To avoid problems with system permissions, we recommend setting up System Data Sources, as these are usually accessible by all accounts on a Windows machine. Using the mxODBC connection constructor mx.ODBC.Windwos.DriverConnect() you can then setup a connection to the database. 3.1.1 Looking for Windows ODBC drivers ? Microsoft supports a whole range of (desktop) ODBC drivers for various databases and file formats. These are available under the name "ODBC Desktop Database Drivers" (search the MS web-site for the exact URL) [wx1350.exe] and also included in the more up-to-date "Microsoft Data Access Components" (MDAC) archive [mdac_typ.exe]. Last time we checked, it included ODBC drivers for: Access, dBase, Excel, Oracle, Paradox, Text (flat file CSV), FoxPro, MS SQL Server. If you need to connect to databases running on other hosts, please contact the database vendor or check the CorVu List of ODBC drivers. mxODBC is often used to access databases across a network. A very typical use case is that of connecting to MS SQL Server, Oracle or DB2 from a Unix machine. We have collected some information which may help you in finding the right solution for this kind of setup. We recommend that you always use an ODBC manager on Unix to access these driver setups, e.g. iODBC or unixODBC. This was tested with mxODBC and is supported by EasySoft. It is recommended to use the bridge with unixODBC. Starting with version 1.4.2 of the bridge, there is full functional Unicode support available if the target ODBC driver supports this (the latest MS SQL Server and MS Access drivers do). Not tested with mxODBC. Unsupported by eGenix. DataDirectand Merant also provide driver sets for connecting to MS SQL Server from Unix. DataDirectand Merant also provide driver sets for connecting to Oracle from Unix. IBM DB2 for Linux ships with ODBC drivers for DB2. These can also be used to connect to DB2 database over a network. 3.2.4 Looking for Unix ODBC drivers ? If you want to run mxODBC in a Unix environment and your database doesn't provide an Unix ODBC driver, you can try the drivers sold by Data-Direct (formerly Intersolv/Merant). They have 30-day evaluation packages available. Another source for commercial ODBC drivers is OpenLink. To see if they support your client/server setup check this matrix. They are giving away 2-client/10-connect licenses for free. For a fairly large list of sources for ODBC drivers have a look on the ODBC driver page provided by the CorVu Cooperation. They also have some informative pages that describe common database functions and operators which are helpful. If you would like to connect to a database for which you don't have a Unix ODBC driver, you can also try the ODBC-ODBC bridge from EasySoft which redirects the queries to e.g. the NT ODBC driver for the database. Alternatively, you could write a remote client (in Python) that communicates with your database via a WinNT-Box. Most databases provide Win95/NT ODBC drivers so you can use mxODBC with the Windows ODBC manager. This method is not exactly high-performance, but cheaper (provided you can come up with a running version in less than a day's work, that is...). The Python standard lib module SocketServer.py should get you going pretty fast. Protocol and security are up to you, of course. mxODBC is structured as Python package to support interfaces to many different ODBC managers and drivers. Each of these interfaces is accessible as subpackage of the mx.ODBC Python package, e.g. on Windows you'd normally use the mx.ODBC.Windows subpackage to access the Windows ODBC manager; on Unix this would typically be either the mx.ODBC.iODBC or mx.ODBC.unixODBC package depending on which of these two standard Unix ODBC managers you have installed. Each of these subpackages behaves as if it were a separate Python database interface, so you actually get more than just one interface with mxODBC. The advantage over other Python database interfaces is that all subpackages share the same logic and programming interfaces, so you don't have to change your application logic when moving from one subpackage to another. This enables programs to run (more or less) unchanged on Windows and Unix, for example. As you may know, there is a standard for Python database interfaces, the Python Database API Specification or Python DB-API for short. Marc-André Lemburg, the author of the mxODBC package, is the editor of this specification, so great care is taken to make mxODBC as compatible to the DB-API as possible. Some things cannot easily be mapped onto ODBC, so there are a few deviations from the standard. Section 4.1 mxODBC and the Python Database API Specification explains these in more detail. The mxODBC package tries to adhere to the Python DB API Version 2.0 in most details. Many features of the old Python DB API 1.0 are still supported to maintain backwards compatibility and simplify porting old Python applications to the new interface. ● cursor.description doesn't return display_size and internal_size; both values are always None since this information is not available through ODBC interfaces and the values are not commonly used in applications. ● cursor.callproc() is only implemented for input parameters for reasons explained in section 4.6 Stored Procedures. ● db.setinputsizes() and db.setoutputsizes() are dummy functions; this is allowed by DB API 2.0. ● The type objects / constructors (formerly found in the dbimodule defined by DB API 1.0) are only needed if you want to write database independent code. ● The connection constructor is available under three different names: ODBC()(DB API 1.0), connect() (DB API 2.0) and Connect() (mxODBC specific). See the next section for details on the used parameters. mxODBC also defines a DriverConnect() constructor which is available for ODBC managers and some ODBC drivers. If you can, please use the DriverConnect() API since this provides more flexibility in configuring the connection. mxODBC extends the DB-API specification in a number of ways. If you want to stay compatible to other Python DB-API compliant interface, you should only use those interfaces which are mentioned in the Python DB-API specification documents. Since ODBC is a widely supported standard for accessing databases, it should in general be possible to use the package with any ODBC version 2.0 - 3.52 compliant ODBC database driver/manager. mxODBC prefers ODBC 3.x over 2.x in case the driver/manager supports both versions of the standard. The ODBC API is very rich in terms of accessing information about what is stored in the database. mxODBC makes most of these APIs available as additional connection and cursor methods and can be put to good use for database and schema introspection. Since many of the parameters and names of the ODBC function names were mapped directly to Python method names (by dropping the SQL prefix and converting them to lower-case), we have not copied the complete ODBC documentation to this page. You can browse and download the MS ODBC reference from the Microsoft MDAC web-site. mxODBC can be configured to use ODBC 2.x or 3.x interfaces by setting the ODBCVER symbol in mxODBC.h to the needed value. It uses the value provided by the ODBC driver header files per default which usually is the latest ODBC standard version available. Most ODBC drivers today support ODBC 3.x and thus mxODBC will try to use APIs from this version if available. All supported ODBC managers (MS ODBC Manager, iODBC and unixODBC) provide the ODBC 3.x interfaces and map these to ODBC 2.x interfaces in case the driver for the database does not comply to ODBC 3.x. However, some drivers only pretend to be ODBC 3.x compliant and raise "Driver not capable" exceptions when using certain ODBC 3.x APIs or features. If you run into such an situation, please contact support for help. The only way to solve this problem currently lies in adding workarounds which are specific to a database. To find out which ODBC version is being supported by the ODBC driver, you can use connection.getinfo(SQL.DRIVER_ODBC_VER). This will return a string giving you the version number, e.g. '03.51.00'. Please also note that there are some changes in behavior between ODBC 2.x and 3.x compatible drivers/managers which means that certain option settings differ slightly between the two versions and that special cases are treated differently for ODBC 3.x than for ODBC 2.x. See the ODBC Documentation for details. mxODBC itself is written in a thread safe way. There are no module globals being used and thus no locking is necessary. Many of the underlying ODBC SQL function calls are wrapped by macros unlocking the global Python interpreter lock before doing the call and regaining that lock directly afterwards. The most prominent of those are the connection APIs and the execute and fetch APIs. In general when using a separate database connection for each thread, you shouldn't run into threading problems. If you do, it is more likely that the ODBC driver is not 100% thread safe and thus not 100% ODBC compatible. Note that having threads share cursors is not a good idea: there are many very strange transaction related problems you can then run into. Unlocking the interpreter lock during long SQL function calls gives your application more responsiveness. This is especially important for GUI based applications, since no other Python thread can run when the global lock is acquired by one thread. mxODBC will only support threading if you have built Python itself with thread support enabled. Python for Windows and most recent Python versions for Unix have this enabled per default. Try: python -c "import thread" to find out. If you get an exception, thread support is not available. ODBC uses auto-commit on new connections per default. This means that all SQL statement executes will directly have an effect on the underlying database even in those cases where you would really back out of a certain modification, e.g. due to an unexpected error in your program. mxODBC turns off auto-commit whenever it creates a new connection, ie. it runs the connection in manual commit mode -- unless the connection constructor flag clear_auto_commit is set to 0 or the database does not provide transactions. Using a connection in manual commit mode means that all your commands are grouped in transactions: only the connection will see the changes it has made to the data in the database until an explicit connection.commit() is issued. The commit informs the database to write all changes done during the last transaction into the global data storage making it visible to all other users. A connection.rollback() on the other hand, tells the database to discard all modifications processed in the last transaction. ● after having issued a .rollback(). Unless you perform an explicit connection.commit() prior to deleting or closing the connection, mxODBC will try to issue an implicit rollback on that connection before actually closing it. Errors are only reported on case you use the connection.close() method. Implicit closing of the connection through Python's garbage collection will ignore any errors occurring during rollback. Data sources that do not support transactions, such as flat file databases (e.g. Excel or CSV files on Windows), cause calls to .rollback() to fail with an NotSupportedError. mxODBC will not turn off auto-commit behavior for these sources. The setting of the connection constructor flag clear_auto_commit has no effect in this case. Some databases for which mxODBC provides special subpackages such as MySQL don't have transaction support, since the database does not provide transaction support. For these subpackages, the .rollback() connection method is not available at all (i.e. calling it produces an AttributeError) and the clear_auto_commit flag on connection constructors defaults to 0. Using the above syntax, you can call stored procedures through one of the .execute*() calls, e.g. will call the stored procedure myprocedure with the input parameters 1, 2. After calling .callproc() or .execute*(), you can then access output from the stored procedure as one or more result sets using the standard .fetch*() cursor methods. If the stored procedure has generate multiple result sets, skipping to the next result set is possible by calling the .nextset() cursor method. mxODBC does not support input/output or output parameters in stored procedures. The reason for this is that the interface for passing back data from the stored procedure requires knowledge of the data size before calling the procedure which is often impossible to deduce (e.g. for string data). Passing back such data in form of one or more result sets gives you a much better alternative which also let's you implement variable length output parameter lists and special output value conversions. You should not use any output SQL statements such as "PRINT" in the stored procedures, since this will cause at least some ODBC drivers (notably the MS SQL Server one) to turn the output into an SQL error which causes the execution to fail. On the other hand, these error messages can be useful to pass along error conditions to the Python program, since the error message string will be the output of the "PRINT" statement. To simplify debugging the mxODBC package can generate debugging output in several important places. The feature is only enabled if the module is compiled with debug support and output is only generated if Python is run in debugging mode (use the Python interpreter flag: python -d script.py). The resulting log file is named mxODBC.log. It will be created in the current working directory; messages are always appended to the file so no trace is lost until you explicitly erase the log file. If the log file can not be opened, the module will use stderr for reporting. To have the package compiled using debug support, prepend the distutils command mx_autoconf --enable-debugging to the build or installcommand. This will then enable the define and compile a debugging version of the code, e.g. Note that the debug version of the module is almost as fast as the regular build, so you might as well leave debugging support enabled. Connection objects provide the communication link between your Python application and the database. They are also the scope of transactions you perform. Each connection can be setup to your specific needs, multiple connections may be opened at the same time. Even though mxODBC provides interfaces to many different ODBC backends using different subpackages, each of these subpackages use the same names and signatures, thereby making applications very portable between ODBC backends. As an example, say if you are using the mx.ODBC.Windows subpackage, then the constructor to call would be mx.ODBC.Windows.DriverConnect(). When porting the application to Unix you'd use the mx.ODBC.iODBC subpackage and the constructor then becomes mx.ODBC.iODBC.DriverConnect(). Please note that some ODBC backends do not support all available ODBC features. As a result, not all constructors and methods may be available. The best way to work around this caveat is to always rely on ODBC managers to achieve the best portability and also to simplify the configuration of the application's database needs. mxODBC uses a dedicated object type for connections. Each mxODBC subpackage defines its own object type, but all share the same name: ConnectionType. This constructor returns a connection object for the given data source. It accepts keyword arguments. dsn indicates the data source to be used, user and password are optional and used for database login. errorhandlermay be given to set the error handler for the Connection object prior to actually connecting to the database. This is useful to mask e.g. certain warnings which can occur at connection time. The errorhandler can be changed after the connection has been established by assigning to the .errorhandlerattribute of the Connection object. The default error handler raises exceptions for all database warnings and errors. If you connect to the database through an ODBC manager, you should use the DriverConnect()API since this allows passing more configuration information to the manager and thus provides more flexibility over this interface. See the following section Default Transaction Settings for details on clear_auto_commit. Is just an alias for Connect() needed for Python DB API 2.0 compliance. This constructor returns a connection object for the given data source which is managed by an ODBC Driver Manager (e.g. the Windows ODBC Manager or iODBC). It allows passing more information to the database than the standard Connect()constructor. Please refer to the documentation of your ODBC manager and the database for the exact syntax of the DSN_string. It typically has this formatting: 'DSN=datasource_name;UID=userid;PWD=password' (case can be important and more entries may be needed to successfully connect to the data source). The DriverConnect() API is only available if the interface was compiled with the compile time switch HAVE_SQLDriverConnect defined. This is the default for ODBC managers such as the one on Windows and iODBC/unixODBC on Unix platforms. See the subpackages section for details. Is just an alias for Connect() needed for Python DB API 1.0 compliance. ODBC usually defaults to auto-commit, meaning that all actions on the connection are directly applied to the database. Since this can be dangerous, mxODBC defaults to turning auto-commit off at connection initiation time provided the database supports transactions. The value of the clear_auto_commit connection parameter overrides this default behavior. Passing a 0 as value disables the clearing of the auto-commit flag and lets the connection use the database's default commit behavior. Please see the database documentation for details on its default transaction setting. Note that a compile time switch (DONT_CLEAR_AUTOCOMMIT) allows altering the default value for clear_auto_commit. Use the connection method connection.setconnectoption( SQL.AUTOCOMMIT, SQL.AUTOCOMMIT_ON|OFF|DEFAULT)to adjust the connection's behavior to your needs after the connection has been established, but before you have opened a database cursor. With auto-commit turned on, transactions are effectively disabled. The rollback() method will raise a NotSupportedError when used on such a connection. If you get an exception during connect telling you that the driver is not capable or does not support transactions, e.g. mxODBC.NotSupportedError: ('S1C00', 84, '[Microsoft][ODBC Excel Driver]Driver not capable ', 4226), try to connect with clear_auto_commit set to 0. mxODBC will then keep auto-commit switched on and the connection will operate in auto-commit mode. All connection constructors implicitly start a new transaction when connecting to a database in transactional mode. When connecting to a database with transaction support, you should explicitly do a .rollback() or .commit() prior to closing the connection. mxODBC does an automatic rollback of the transaction when the connection is closed if the driver supports transactions. Close the connection now (rather than automatically at garbage collection time). The connection will be unusable from this point on; an Error (or subclass) exception will be raised if any operation is attempted with the connection. The same applies to all cursor objects trying to use the connection. Commit any pending changes and implicitly start a new transaction. For connections which do not provide transaction support or operate in auto-commit mode, this method does nothing. Constructs a new Cursor Object with the given name using the connection. If no name is given, the ODBC driver will determine a unique name on its own. You can query this name with cursor.getcursorname() (see the Cursor Object section 6). Same as above, except that the corresponding ODBC function is SQLGetConnectOption(). option must be an integer. Suitable option values are available through the SQL object (see the Constants section 10 for details). The method returns the data as 32-bit integer. It is up to the user to decode the integer value using the SQL defines available through the SQL constant. Interface to the corresponding ODBC function SQLGetInfo(). The info_id must be an integer. Suitable values are available through the SQL object (see the Constants section 10 for details). The method returns a tuple (integer, string) giving an integer decoding (in native integer byte order) of the first bytes of the API's result as well as the raw buffer data as string. It is up to the caller to decode the data (e.g. using the struct module). This API gives you a very wide range of information about the underlying database and its capabilities. See the ODBC documentation for more information. This method returns the command as it would have been modified by the driver to pass to the database engine. It is a direct interface to the ODBC API SQLNativeSql(). In many cases it simply returns the command string unchanged. Some drivers unescape ODBC escape sequences in the command string. Syntax checking is usually not applied by this method and errors are only raised in case of command string truncation. Not all mxODBC subpackages support this API. In case the database connection has transactions enabled, this method causes the database to roll back any changes to the start of the current transaction. Closing a connection without committing the changes first will cause an implicit rollback to be performed. This method is only available if the database subpackage was compiled with transaction support. For ODBC manager subpackages it may raise a NotSupportedError in case the connection does not support transactions. This method lets you set some ODBC integer options to new values, e.g. to set the transaction isolation level or to turn on auto-commit. option must be an integer. Suitable option values are available through the SQL object, e.g. SQL.ATTR_AUTOCOMMIT corresponds to the SQL option SQL_ATTR_AUTOCOMMIT in C (see the Constants section 10 for details). The method is a direct interface to the ODBC SQLSetConnectOption() function. Please refer to the ODBC documentation for more information. Note that while the API function also supports setting character fields, the method currently does not know how to handle these. Adabas, SAP DB and MAX DB can emulate several different SQL dialects. They have introduced an option for this to be set. These are the values you can use: 1 = ADABAS, 2 = DB2, 3 = ANSI, 4 = ORACLE, 5 = SAPR3. The option code is SQL.CONNECT_OPT_DRVR_START + 2 according to the Adabas documentation. Please consult your driver documentation for details. Attribute to query and set the input variable binding method used by the connection. This can either be BIND_USING_PYTHONTYPE of BIND_USING_SQLTYPE (see the Constants section 10 for details). Read-only attribute that is true in case the connection is closed. Any action on a closed connection will result in a ProgrammingError to be raised. This variable can be used to conveniently test for this state. Read/write attribute that sets the converter callback default for all newly created cursors using the connection. It is None per default (meaning to use the standard conversion mechanism). See the Supported Data Types section for details. Use this instance variable to set the default output format for date/time/timestamp columns of all cursors created using this connection object. datetime.date, datetime.time, datetime.datetime instances. Only available using Python 2.4 and later. Ticks (number of seconds since the epoch) and tocks (number of seconds since midnight). Python tuples as defined in the Supported Data Types section. Python strings. The format used depends on the internal settings of the database. See your database's manuals for the exact format and ways to change it. We strongly suggest always using the DateTime/DateTimeDelta instances. Note that changing the values of this attribute will not change the date/time format for existing cursors using this connection. String identifying the database manager system. String identifying the database manager system version. Use this instance variable to set the default output format for decimal and numeric columns of all cursors created using this connection object. Values are returned as Python floats. Values are returned as Python decimal.Decimal instances. Only available using Python 2.4 and later. Note that changing the values of this attribute will not change the decimal format for existing cursors using this connection. String identifying the ODBC driver. String identifying the ODBC driver version. Read/write attribute which defines the encoding to use for converting Unicode to 8-bit strings and vice-versa. If set to None (default), Python's default encoding will be used, otherwise it has to be a string providing a valid encoding name, e.g. 'latin-1' or 'utf-8'. Read/write attribute which defines the error handler function to use. If set to None, the default handling is used, i.e. errors and warnings all raise an exception and get appended to the .messages list. An error handler must be a callable object taking the arguments (connection, cursor, errorclass, errorvalue) where connection is a reference to the connection, cursor a reference to the cursor (or None in case the error does not apply to a cursor), errorclass is an error class which to instantiate using errorvalue as construction argument. See the Error Handlers section 9 for details. String with the license information of the installed mxODBC license. This is a Python list object to which mxODBC appends tuples (exception class, exception value) for all messages which the interfaces receives from the underlying ODBC driver or manager for this connection. The list is cleared automatically by all connection methods calls (prior to executing the call) except for the info and connection option methods calls to avoid excessive memory usage and can also be cleared by executing del connection.messages[:]. All error and warning messages generated by the ODBC driver are placed into this list, so checking the list allows you to verify correct operation of the method calls. Use this attribute to set or query the default input and output handling for string columns of all cursors created using this connection object. Data conversion on input is dependent on the input binding type. This format tells mxODBC to convert all data passed to and read from the ODBC driver to 8-bit strings. On input, Python 8-bit strings are passed to the ODBC driver as-is. Unicode objects are converted to Python 8-bit strings assuming the connection's encoding setting (see the .encodingattribute of connection objects) prior to passing them to the ODBC driver. On output, all string columns are fetched as strings and passed back as Python 8-bit string objects. Unicode data from the database is converted to Python 8-bit string objects assuming the connection's encoding setting (see the .encodingattribute of connection objects). This setting emulates the behavior of previous mxODBC versions and is the default. This format lets the ODBC driver decide which string format to use for the communication, providing the most efficient way of communicating with the driver. Input and output conversion is dependent on the data format the ODBC driver expects or returns for a given column. If the driver returns a string, a Python string is created; if it returns Unicode data, a Python Unicode object is used. This format can be used to emulate Unicode support with a database backend that doesn't have a native Unicode data type or where the ODBC driver cannot handle Unicode data. On input, Python strings are passed to the ODBC driver as-is. Unicode objects are converted to 8-bit strings using the connection's encoding setting (see the .encodingattribute of connection objects) and then passed to the ODBC driver. On output, string data is converted to Python Unicode objects, based on the same conversion technique. Use this setting if you plan to use Unicode objects with non-Unicode aware databases (e.g. by setting the encoding to UTF-8 -- be careful though: multibyte character encodings usually take up more space and are not necessarily compatible with the database's string functions). This format should be used for databases and applications that support native Unicode data communication. String columns are converted to Python Unicode objects assuming the connection's encoding setting (see the .encodingattribute of connection objects) and then passed as Unicode to the ODBC driver. On output, string data is always fetched as Unicode data from the ODBC driver and returned using Python Unicode objects. Note that even though mxODBC may report that Unicode support is enabled (default in Python 2.0 and later; HAVE_UNICODE_SUPPORT is set to 1), the ODBC driver may still reject Unicode data. In this case, an InternalErrorof type 'S1003' is raised whenever trying to read data from the database in this .stringformatmode. You can use the included mx/ODBC/Misc/test.py script to find out whether the database backend support Unicode or not. Binary and other plain data columns will still use 8-bit strings for interfacing, since storing this data in Unicode objects would cause trouble. mxODBC will eventually use buffer or some form of binary objects to store binary data in some future version, e.g. the new bytes type which will be introduced with Python 3.0. This variable only has an effect if mxODBC was compiled with Unicode support (default for Python 2.0 and later). If not, mxODBC will always work in EIGHTBIT_STRINGFORMAT mode. In addition to the above attributes, all exception objects used by the connection's subpackage are also exposed on the connection objects as attributes, e.g. connection.Error gives the Error exception of the subpackage which was used to create the connection object. See the Exceptions and Error Handling section 9 for details and names of these error attributes. These objects represent a database cursor: an object which is used to manage the context of a database query operation. This includes preparing and parsing the query or command to be executed on the connection, executing the query or command one or multiple times and providing a pointer into the result set or sets generated by queries. Cursors are created through a database connection. As a result, cursor objects are only usable as long as the connection object exists and the associated database connection is open and working. All operations of a cursor are done through the connection that was used to create it. The scope and default settings of a cursor are defined by the connection. Once created, you can change various settings of the cursor, e.g. the cursor.datetimeformat. Such changes do not affect the connection or any other cursor objects created on the connection. Using cursors on a closed connection will result in a ProgrammingError to be raised. Depending on the capabilities of the database and the used ODBC driver, you can have multiple cursors open on a single connection and execute queries and commands on each at will. This makes it possible to e.g. prepare and then cache often used commands. Cursor objects are supported by all subpackages included in mxODBC. The extent to which the functionality and number of methods is supported may differ from subpackage to subpackage, so you have to verify the functionality of the used methods (esp. the catalog methods) for each subpackage and database that you intend to use. mxODBC uses a dedicated object type for cursors. Each subpackage defines its own object type, but all share the same name: CursorType. Cursor objects are created using the connection method connection.cursor(). Please see 5.3Connection Object Methods for details. Call a stored database procedure with the given name. The sequence of parameters must contain one entry for each argument that the procedure expects. The result of the call is returned as modified copy of the input sequence. Input parameters are left untouched, output and input/output parameters replaced with possibly new values. This method is only implemented for input parameters in mxODBC for reasons explained in 4.6 Stored Procedures. Future versions of mxODBC may also support in/out and output parameters. Close the cursor now (rather than automatically at garbage collection time). The cursor will be unusable from this point forward; an Error (or subclass) exception will be raised if any operation is attempted with the cursor. Parameters must be provided as sequence and will be bound to variables found in the operationstring on a positional basis. Variables in the operationstring are specified using the ODBC variable placeholder '? ', e.g. 'SELECT name,id FROM table WHERE amount > ? AND amount < ? ', and get bound in the order they appear in the SQL statement operation from left to right. A reference to the operation string will be retained by the cursor. If the same operation string object is passed in again, the cursor will optimize its behavior by reusing the previously prepared statement. This is most effective for algorithms where the same operation is used, but different parameters are bound to it, e.g. in loops iterating over input data items. Use .executemany()if you want to apply the operation to a sequence of parameters in one call, e.g. to insert multiple rows in a single call. operation may be a Unicode object in case the ODBC driver and/or database support this. Return values are not defined. Just like .execute(), except that no prepare step is issued and the operation is not cached. This can result in better performance with some ODBC driver setups, but also implies that Python type binding mode is used to bind the parameters. Prepare a database operation (query or command) and then execute it against all parameter sequences found in the sequence seq_of_parameters. If the optional integer direct is given and true, mxODBC will not cache the operation, but submit it for one-time execution to the database. This can result in better performance with some ODBC driver setups, but also implies that Python type binding mode is used to bind the parameters. Fetch all (remaining) rows of a query result, returning them as a sequence of sequences (e.g. a list of tuples). An Error (or subclass) exception is raised if the previous call to .execute*() did not produce any result set or no call was issued yet. Fetch the next set of rows of a query result, returning a sequence of sequences (e.g. a list of tuples). An empty sequence is returned when no more rows are available. The number of rows to fetch per call is specified by the parameter. If it is not given, the cursor's .arraysize determines the number of rows to be fetched. The method will try to fetch as many rows as indicated by the size parameter. If this is not possible due to the specified number of rows not being available, fewer rows may be returned. Fetch the next row of a query result set, returning a single sequence, or None when no more data is available. mxODBC will move the associated database cursor forward by one row only. Frees any pending result set used by the cursor. If you only fetch some of the rows of large result sets you can optimize memory usage by calling this method. Note that .execute*() and all the catalog methods do an implicit .flush() prior to executing a new query. If you plan to write cross database applications, use these methods with care, since at least some of the databases don't support certain APIs or return misleading results. Be sure to check the correct performance of the methods and executes. We don't want to see you losing your data due to some error we made, or the fact that the ODBC driver of your database is buggy or not fully ODBC-compliant. This method sets the converter function to use for subsequent fetches. Passing None as converter will reset the converter mechanism to its default setting. See the Supported Data Types section 7 for details on how user-defined converters work. Returns the current cursor name associated with the cursor object. This may either be the name given to the cursor at creation time or a name generated by the ODBC driver for it to use. Returns the given cursor option. This method interfaces directly to the ODBC function SQLGetCursorOption(). option must be an integer. Suitable option values are available through the SQL object. Returns the query timeout in seconds used for the cursor. Note that not all ODBC drivers support this option. Check whether asynchronous execution of commands is enabled. Returns the length limit for fetching column data. Returns the maximum number of rows a .fetchall() command would return from the result set. Check whether the ODBC driver will scan the SQL commands for ODBC escape sequences or not. Returns the row number of the current row in the result set or 0 if it cannot be determined. The method returns the data as 32-bit integer. It is up to the caller to decode the integer using the SQL defines. Works like .fetchone() to make cursors compatible to the iterator interface (new in Python 2.2). Raises a StopIteration at the end of a result set. This method will make the cursor skip to the next available set, discarding any remaining rows from the current set. If there are no more sets, the method returns None. Otherwise, it returns a true value and subsequent calls to the fetch methods will return rows from the next result set. Prepare a database operation (query or command) statement for later execution and set cursor.command. To execute a prepared statement, pass cursor.command to one of the .execute*()methods. This method is unavailable if mxODBC was compiled with compile time switch DISABLE_EXECUTE_CACHE. Scroll the cursor in the result set according to mode. If mode is 'relative'(default), value is taken as offset to the current position in the result set, if set to 'absolute', value gives the absolute position. An IndexError is raised in case the scroll operation leaves the result set. In this case, the cursor position is not changed. This method will use native scrollable cursors, if the datasource provides these, or revert to an emulation for forward-only scrollable cursors. Please check whether the data source supports this method using the included mx/ODBC/Misc/test.py script. Some ODBC drivers have trouble scrolling in result sets which use BLOBs or other data types for which the data size cannot be determined at prepare time. mxODBC currently raises a NotSupportedError in case a request for backward scrolling is made in such a result set. Hopefully, this will change as ODBC drivers become more mature. Sets the name to be associated with the cursor object. There is a length limit for names in SQL at 18 characters. An InternalError will be raised if the name is too long or otherwise not useable. Sets a cursor option to a new value. Only a subset of the possible option values defined by ODBC are available since this method could otherwise easily cause mxODBC to segfault - it makes changes possible which effect the way mxODBC interfaces to the ODBC driver. Only options with numeric values are currently supported. Sets the query timeout in seconds used for the cursor. Queries that take longer raise an exception after the timeout is reached. Enable asynchronous execution of commands. Maximum length of any fetched column. Default is no limit. Limit the maximum number of rows to fetch in a result set. Default is no limit. Tell the ODBC driver not to scan the SQL commands and unescape (expand) any ODBC escape sequences it finds. Default is to scan for them. This methods does nothing in mxODBC, it is just needed for DB API compliance. Returns the cursor itself. This method makes cursor objects usable as iterators (new in Python 2.2). Catalog methods allow you to access meta-level and structural information about a data source in a portable way. Some ODBC drivers do not support all of these methods or return unusable data. As a result, you should verify correct operation for your target data sources prior to relying on these methods. All of the following catalog methods use the same interface: they do an implicit call to cursor.execute() and return their output in form of a list of rows which that can be fetched with the cursor.fetch*() methods in the usual way. The number of available rows is available via cursor.rowcount. All catalog methods support keywords and use the indicated default values for parameters which are omitted in the call. Please refer to the ODBC documentation for more detailed information about parameters (if you pass None as a value where a string would be expected, that entry is converted to NULL before passing it to the underlying ODBC API). Note that the result set layouts described here may not apply to your data source. Some databases do not provide all the information given here and thus generate slightly different result sets; expect column omissions or additions. The search patterns given as parameters to these catalog methods are usually interpreted in a case-sensitive way. This means that even if the database itself behaves case-insensitive for identifiers, you may still not find what you're looking for if you don't use the case which the database internally uses to store the identifier. As an example take the SAP DB: it stores all unquoted identifiers using uppercase letters. Trying to fetch e.g. information about a table using a lowercase version of the name will result in an empty result set. You can use connection.getinfo(SQL.IDENTIFIER_CASE) to determine how the database stores identifiers. See the ODBC documentation for details. The name of the schema containing TABLE_NAME. The name of the table, or view, or alias, or synonym. Name of the column of the specified table, view, alias, or synonym. SQL data type of column identified by COLUMN_NAME. Character string representing the name of the data type corresponding to DATA_TYPE. If the DATA_TYPE column value denotes a character or binary string, then this column contains the maximum length in characters for the column. For date, time, timestamp data types, this is the total number of characters required to display the value when converted to character. For numeric data types, this is either the total number of digits, or the total number of bits allowed in the column, depending on the value in the NUM_PREC_RADIX column in the result set. The maximum number of bytes for the associated C buffer to store data from this column if SQL_C_DEFAULT were specified on the SQLBindCol(), SQLGetData() and SQLBindParameter() calls. This length does not include any null-terminator. For exact numeric data types, the length accounts for the decimal and the sign. The scale of the column. NULL is returned for data types where scale is not applicable. Either 10 or 2 or NULL. If DATA_TYPE is an approximate numeric data type, this column contains the value 2, then the COLUMN_SIZE column contains the number of bits allowed in the column. If DATA_TYPE is an exact numeric data type, this column contains the value 10 and the COLUMN_SIZE contains the number of decimal digits allowed for the column. For numeric data types, the database can return a NUM_PREC_RADIX of either 10 or 2. SQL.NO_NULLS if the column does not accept NULL values. May contain descriptive information about the column or NULL. It is possible that no usable information is returned in this column (due to optimizations). The column's default value. If the default value is a numeric literal, then this column contains the character representation of the numeric literal with no enclosing single quotes. If the default value is a character string, then this column is that string enclosed in single quotes. If the default value a pseudo-literal, such as for DATE, TIME, and TIMESTAMP columns, then this column contains the keyword of the pseudo-literal (e.g. CURRENT DATE) with no enclosing quotes. If NULL was specified as the default value, then this column returns "NULL". If the default value cannot be represented without truncation, then this column contains "TRUNCATED" with no enclosing single quotes. If no default value was specified, then this column is NULL. SQL data type. This column is the same as the DATA_TYPE column. The subtype code for datetime data types: SQL.CODE_DATE, SQL.CODE_TIME, SQL.CODE_TIMESTAMP. For all other data types this column returns NULL. Contains the maximum length in octets for a character data type column. For Single Byte character sets, this is the same as COLUMN_SIZE. For all other data types it is NULL. The ordinal position of the column in the table. The first column in the table is number 1. Contains the string "NO" if the column is known to be not nullable; and "YES" otherwise. Authorization ID of the user who granted the privilege. Authorization ID of the user to whom the privilege is granted. The table privilege. This may be one of the following strings: "INSERT", "REFERENCES", "SELECT", "UPDATE". Indicates whether the grantee is permitted to grant the privilege to other users. This can be "YES", "NO" or NULL. The name of the schema containing PKTABLE_NAME. Name of the table containing the primary key. The name of the schema containing FKTABLE_NAME. The ordinal position of the column in the key, starting at 1. Action to be applied to the foreign key when the SQL operation is UPDATE: SQL.RESTRICT, SQL.NO_ACTION, SQL.CASCADE, SQL.SET_NULL. Foreign key identifier. NULL if not applicable to the data source. Primary key identifier. NULL if not applicable to the data source. Possible values: SQL.INITIALLY_DEFERRED, SQL.INITIALLY_IMMEDIATE, SQL.NOT_DEFERRABLE. Character representation of the SQL data type name, e.g. "VARCHAR", "DATE", "INTEGER". Prefix for a literal of this data type. This column is NULL for data types where a literal prefix is not applicable. Suffix for a literal of this data type. This column is NULL for data types where a literal prefix is not applicable. The text of this column contains a list of keywords, separated by commas, corresponding to each parameter the application may specify in parenthesis when using the name in the TYPE_NAME column as a data type in SQL. The keywords in the list can be any of the following: "LENGTH", "PRECISION", "SCALE". They appear in the order that the SQL syntax requires that they be used. NULL is returned if there are no parameters for the data type definition, (such as INTEGER). Note: The intent of CREATE_PARAMS is to enable an application to customize the interface for a DDL builder. SQL.NO_NULLS - NULL values are disallowed. SQL.NULLABLE - NULL values are allowed. Indicates whether the data type can be treated as case sensitive for collation purposes; valid values are SQL.TRUE and SQL.FALSE. SQL.UNSEARCHABLE: if the data type cannot be used in a WHERE clause. SQL.LIKE_ONLY: if the data type can be used in a WHERE clause only with the LIKE predicate. SQL.ALL_EXCEPT_LIKE: if the data type can be used in a WHERE clause with all comparison operators except LIKE. SQL.SEARCHABLE: if the data type can be used in a WHERE clause with any comparison operator. Indicates where the data type is unsigned. The valid values are: SQL.TRUE, SQL.FALSE or NULL. A NULL indicator is returned if this attribute is not applicable to the data type. Contains the value SQL.TRUE if the data type is exact numeric and always has the same precision and scale; otherwise, it contains SQL.FALSE. Contains SQL.TRUE if a column of this data type is automatically set to a unique value when a row is inserted; otherwise, contains SQL.FALSE. This column contains any localized (native language) name for the data type that is different from the regular name of the data type. If there is no localized name, this column is NULL. This column is intended for display only. The character set of the string is locale-dependent and is typically the default character set of the database. The minimum scale of the SQL data type. If a data type has a fixed scale, the MINIMUM_SCALE and MAXIMUM_SCALE columns both contain the same value. NULL is returned where scale is not applicable. The maximum scale of the SQL data type. NULL is returned where scale is not applicable. If the maximum scale is not defined separately in the database, but is defined instead to be the same as the maximum length of the column, then this column contains the same value as the COLUMN_SIZE column. Datetime interval precision or NULL is interval types are not supported by the database. Column sequence number in the primary key, starting with 1. The name of the schema containing PROCEDURE_NAME. Number of result sets returned by the procedure. Contains the descriptive information about the procedure. SQL.PT_UNKNOWN: It cannot be determined whether the procedure returns a value. SQL.PT_PROCEDURE: The returned object is a procedure; that is, it does not have a return value. SQL.PT_FUNCTION: The returned object is a function; that is, it has a return value. SQL.PARAM_TYPE_UNKNOWN: the parameter type is unknown. SQL.PARAM_INPUT: this parameter is an input parameter. SQL.PARAM_INPUT_OUTPUT: this parameter is an input / output parameter. SQL.PARAM_OUTPUT: this parameter is an output parameter. SQL.RETURN_VALUE: the procedure column is the return value of the procedure. SQL.RESULT_COL: this parameter is actually a column in the result set. SQL data type of column. The maximum number of bytes for the associated C buffer to store data from this column if SQL.C_DEFAULT were specified on the SQLBindCol(), SQLGetData() and SQLBindParameter() ODBC calls used internally by mxODBC. This length does not include any null-terminator. For exact numeric data types, the length accounts for the decimal and the sign. Note: This column is of little value to Python applications. The ordinal position of the parameter column in the procedure call. The first column has an ordinal position of 1. Contains the string "NO" if the column is known to be not nullable, "" if this cannot be determined, or "YES" if it is known to be nullable. The duration for which the name in COLUMN_NAME is guaranteed to point to the same row. Contains one of the following values: SQL.SCOPE_CURROW, SQL.SCOPE_TRANSACTION, SQL.SCOPE_SESSION. Name of the column that is (or part of) the table's primary key. Indicates whether or not the column is a pseudo-column. Possible values: SQL.PC_NOT_PSEUDO, SQL.PC_UNKNOWN, SQL.PC_PSEUDO. SQL.TRUE if the index allows duplicate values. SQL.FALSE if the index values must be unique. NULL is returned if the TYPE column indicates that this row is SQL.TABLE_STAT (statistics information on the table itself). The string that would be used to qualify the index name in the DROP INDEX statement. Appending a period (.) plus the INDEX_NAME results in a full specification of the index. The name of the index. If the TYPE column has the value SQL.TABLE_STAT, this column has the value NULL. SQL.TABLE_STAT - Indicates this row contains statistics information on the table itself. SQL.INDEX_CLUSTERED - Indicates this row contains information on an index, and the index type is a clustered index. SQL.INDEX_HASHED - Indicates this row contains information on an index, and the index type is a hashed index. SQL.INDEX_OTHER - Indicates this row contains information on an index, and the index type is other than clustered or hashed. Ordinal position of the column within the index whose name is given in the INDEX_NAME column. A NULL value is returned for this column if the TYPE column has the value of SQL.TABLE_STAT. Name of the column in the index. A NULL value is returned for this column if the TYPE column has the value of SQL.TABLE_STAT. Sort sequence for the column; "A" for ascending, "D" for descending. NULL value is returned if the value in the TYPE column is SQL.TABLE_STAT. If the TYPE column contains the value SQL.TABLE_STAT, this column contains the number of rows in the table. If the TYPE column value is not SQL.TABLE_STAT, this column contains the number of unique values in the index. A NULL value is returned if the information cannot be determined. If the TYPE column contains the value SQL.TABLE_STAT, this column contains the number of pages used to store the table. If the TYPE column value is not SQL.TABLE_STAT, this column contains the number of pages used to store the indexes. If the index is a filtered index, this is the filter condition. NULL is returned if TYPE is SQL.TABLE_STAT or the database does not support filtered indexes. The name of the catalog containing TABLE_SCHEM. This column contains a NULL value. Identifies the type given by the name in the TABLE_NAME column. It can have the string values "TABLE", "VIEW", "INOPERATIVE VIEW", "SYSTEM TABLE", "ALIAS", or "SYNONYM". Contains the descriptive information about the table. The table privilege. This may be one of the following strings: "ALTER", "CONTROL", "INDEX", "DELETE", "INSERT", "REFERENCES", "SELECT", "UPDATE". This read/write attribute specifies the number of rows to fetch at a time with .fetchmany(). It defaults to 1 meaning to fetch a single row at a time. mxODBC observes this value with respect to the .fetchmany() method, but currently interacts with the database a single row at a time. This read-only attribute is true if the cursor or the underlying connection was closed by calling the .close() method. Any action on a closed connection or cursor will result in a ProgrammingError to be raised. This variable can be used to conveniently test for this state. This read-only attribute specifies the number of columns in the current result set. The attribute is -1 in case no .execute*() has been performed on the cursor. Provides access to the last SQL command string or Unicode object that was passed to .prepare() or .execute*(). If no such command is available, None is returned. It is set by .prepare() and .execute*() and reset by calling one of the catalog methods or .close() on the cursor. Note that .command may be a Unicode object in case a Unicode object was passed to one of the above methods. Connection object on which the cursor operates. Attribute to set the output format for date/time/timestamp columns on a per cursor basis. It takes the same values as the connection.datetimeformat instance variable and defaults to the creating connection object's settings for date/time format. Attribute to set the output format for decimal/numeric columns on a per cursor basis. It takes the same values as the connection.decimalformat instance variable and defaults to the creating connection object's settings for decimal format. This read-only attribute is a sequence of 7-item sequences for operations that produce a result set (which may be empty). Each of these sequences contains information describing one result column: (name, type_code, display_size, internal_size, precision, scale, null_ok). This attribute will be None for operations that do not return rows or if the cursor has not had an operation invoked via the .execute*() method yet. mxODBC always returns None for display_size and internal_size. This information can be obtained via connection.gettypeinfo(), if needed. The type_code can be interpreted by comparing it to the type objects specified in the section 7 Type Objects and Constructors below. mxODBC returns the SQL type integers in this field. These are described in the section 7 Supported Data Types and are available through the SQL singleton defined at module level. This is a Python list object to which the standard mxODBC error handler appends tuples (exception class, exception value) for all messages which the interfaces receives from the underlying ODBC driver or manager for this cursor. See the Error Handlers section 9 for details. The list is cleared by all cursor methods calls (prior to executing the call) except for the .fetch*() calls to avoid excessive memory usage and can also be cleared explicitly by executing del cursor.messages[:]. An application can use the information in this list to verify correct operation of the method calls. This is particularly useful if the ODBC driver or database splits the error information across multiple error messages. In such a case, only one of the messages will be used to raise the exception by mxODBC (usually the top-most), but this message may not provide enough information to track down the problem. This read-only attribute specifies the number of parameters in the current prepared command. The attribute is -1 in case this information is not available. This read-only attribute specifies the number of rows that the last .execute*() produced (for DQL statements like select) or affected (for SQL DML statements like update or insert). The attribute is -1 in case no .execute*() has been performed on the cursor or the rowcount of the last operation is not determinable by the interface or the database. You should check whether the database you are interfacing to supports .rowcount before writing code which relies on it. Many databases such as MS Access and Oracle do not provide this information to the ODBC driver, so .rowcountwill always be -1. This read-only attribute provides the current 0-based row position of the cursor in the result set. The next .fetch*() will return rows starting at the given position. The row position is automatically updated whenever the cursor moves through the result set, either due to fetches or scrolls. The attribute is None in case no .execute*() has been performed on the cursor or the cursor position cannot be determined. You should check whether the database you are interfacing to supports .rownumber before writing code which relies on it. Many databases such as MS Access and Oracle do not provide this information to the ODBC driver, so .rownumber will always be None. Attribute to set the conversion format for string columns on a per cursor basis. It takes the same values as the connection.stringformat instance variable and defaults to the creating connection object's settings for stringformat. mxODBC tries to maintain as much of the available information across the Python-ODBC bridge as possible. In order to implement this, mxODBC converts between the ODBC and the Python world by using native data types in both worlds. You should note however, that some ODBC drivers return data using different types than the ones accepted for input, e.g. a database might accept a time value, convert it internally to a timestamp and then return it in a subsequent SELECT as timestamp value. mxODBC cannot know that the value only contains valid time information and no date information and thus converts the output data into an mxDateTime DateTime instance instead of an mx.DateTime.DateTimeDelta instance (which would normally be returned for time values). The included mx/ODBC/Misc/test.py can help to check for this behavior. It tests many common column types and other database features which are useful to know when writing applications for a particular database backend. When passing parameters to the .execute*() methods of a cursor, mxODBC has to apply type conversions to the parameters in order to send them to the database in an appropriate form. This process is called binding a variable. The database is asked for the appropriate data type and mxODBC tries to convert the input variable into that type. This is the preferred binding mode since it allows to choose the right conversion before passing the data to the ODBC driver. mxODBC looks at the type of the input variable and passes its value to the database directly; conversion is done by the ODBC driver/manager as necessary. The default depends on the settings with which the ODBC subpackage was compiled. If not indicated in the Subpackages section 12, it is set to SQL type binding mode (BIND_USING_SQLTYPE), since this offers more flexibility than Python type binding. For SQL type binding to be usable, mxODBC needs a working ODBC SQLDescribeParam() API implementation. This is checked at connect time and the binding style adjusted to Python type binding, if mxODBC cannot rely on SQLDescribeParam(). Unfortunately, not all database ODBC drivers tell the truth about the capabilities of their SQLDescribeParam() implementation, so workarounds are in place for a few known cases. If you find more such cases, please contact support for help. The following data types are used for SQL type input binding mode (connection.bindmethod set to BIND_USING_SQLTYPE). The SQL type is what the database ODBC driver expects from mxODBC. The interface then tries to convert the Python input objects to the Python type given in the table before passing it on to the ODBC driver. The conversion truncates the string at the SQL field length. The handling of special characters depends on the codepage the database uses. Some database drivers/managers can't handle binary data in these column types, so you better check the database's capabilities with the included mx/ODBC/Misc/test.py first before using them. The handling of Unicode depends on the setting of the .stringformat attribute. STRINGFORMAT mode, Unicode is passed to the ODBC driver as native Unicode. Strings are converted to Unicode using the connection's character .encoding setting. In all other modes, Unicode is converted to an 8-bit string before passing it to the ODBC driver using the connection's character .encoding setting. Strings are passed as-is. The conversion truncates the string at the SQL field length. Note that currently only very few ODBC drivers can handle native Unicode. The MS Access and SQL Server ODBC drivers are the only ones we have successfully tested. The only way to store Unicode data in a non-Unicode aware database is by encoding it using e.g. UTF-8. In EIGHTBIT_STRINGFORMAT and UNICODE_STRINGFORMAT mode, Unicode is converted to an 8-bit string before passing it to the ODBC driver using the connection's character .encoding setting. Strings are passed as-is. In all other modes, Unicode is passed to the ODBC driver as native Unicode. Strings are converted to Unicode before passing them to the ODBC driver using the connection's character .encoding setting. Truncation at the SQL field length. These columns can contain embedded 0-bytes and other special characters. Handling of these column types is database dependent. Please refer to the database's documentation for details. Many databases store the passed in data as-is and thus make these columns types useable as storage facility for arbitrary binary data. Conversion from the Python integer (a C long) to the SQL type is left to the ODBC driver/manager, so expect the usual truncations. Conversion to and from the Python long integer is done via string representation since there is no C type with enough precision to hold the value. Because of this, you might receive errors indicating truncation or errors because the database sent string data that cannot be converted to a Python long integer. Not all SQL databases implement this type or impose size limits. Conversion from the Python float (a C double) to the SQL type is left to the ODBC driver/manager, so expect the usual truncations. Python decimals are passed to that database as strings, so no truncation or loss of precision occurs. While you should use DateTime instances, the module also excepts Python datetime.date instances, ticks (Python numbers indicating the number of seconds since the Unix Epoch; these are converted to local time and then stored in the database) and tuples (year,month,day) on input. While you should use DateTimeDelta instances, the module also excepts Python datetime.time instances, tocks (Python numbers indicating the number of seconds since 0:00:00.00) and tuples (hour,minute,second) on input. While you should use DateTime instances, the module also excepts Python datetime.datetime instances, ticks (Python numbers indicating the number of seconds since the epoch; these are converted to local time and then stored in the database) and tuples (year,month,day, hour,minute,second) on input. The Python None singleton is converted to the special SQL NULL value. Input binding to these columns is done via strings (or stringified versions of the input data). The following mappings are used for input variables in Python type input binding mode (connection.bindmethod set to BIND_USING_PYTHONTYPE). The table shows how the different Python types are converted to SQL types. The conversion truncates the string at the SQL field length. If the string contains binary data, SQL.VARBINARY is used for passing the data to the ODBC driver/manager. The long variants are used for strings longer than 256 characters. The conversion truncates the string at the SQL field length. Note that not all ODBC drivers/managers support Unicode data at C level. This binding is used for all cursors which do not have the .stringformat attribute set to EIGHTBIT_STRINGFORMAT or UNICODE_STRINGFORMAT. In EIGHTBIT_STRINGFORMAT mode (default) and UNICODE_STRINGFORMAT mode, Unicode objects are converted to a 8-bit strings first and then passed to the ODBC driver/manager. The long variant is used for Unicode data longer than 256 code points. The conversion truncates the string at the SQL field length. The string may contain binary data. If the ODBC driver/manager doesn't support processing binary data using strings, wrap the data object using Python buffers (via the buffer() constructor) to have mxODBC use a binary SQL type for interfacing to the driver/manager. The Oracle ODBC drivers usually need this. The long variant is used for binary data longer than 256 bytes. Conversion from the signed long to the SQL column type is left to the ODBC driver/manager, so expect the usual truncations. Conversion from the Python long integer is done via the string representation since there usually is no C type with enough precision to hold the value. Conversion from the Python float (a C double) to the SQL column type is left to the ODBC driver/manager, so expect the usual truncations. Conversion from a Python decimal.Decimal instance is done via the string representation to avoid losing precision. The long variant is used for decimal representations longer than 256 characters. Converts the DateTime instance into a TIMESTAMP or DATE struct defined by the ODBC standard. The ODBC driver may use the time part of the instance or not depending on the SQL column type (DATE or TIMESTAMP). Converts the DateTimeDelta instance into a TIME struct defined by the ODBC standard. Fractions of a second will be lost in this conversion. Converts the datetime.date instance into a DATE struct defined by the ODBC standard. Converts the datetime.time instance into a TIME struct defined by the ODBC standard. Converts the datetime.datetime instance into a TIMESTAMP struct defined by the ODBC standard. Conversion is done by calling str(variable) and then passing the resulting string value to the ODBC driver/manager. Same notes as for strings apply. See the ODBC documentation and your ODBC driver's documentation for more information on how these C data types are mapped to SQL column types. The handling of special characters depends on the codepage the database uses. In NATIVE_UNICODE_STRINGFORMAT and UNICODE_STRINGFORMAT mode, the string data is converted to a Python Unicode object based on the connection's encoding setting. Whether a Python string or Unicode object is returned depends on the setting of the .stringformat attribute of the cursor fetching the data. Unicode is only available in case mxODBC was compiled with Unicode support. In EIGHTBIT_STRINGFORMAT mode, the Unicode data is converted to a Python string object based on the connection's encoding setting. These can contain embedded 0-bytes and other special characters. Bits are converted to Python integers 0 and 1 resp. Unsigned short integers are fetched as Python integers, unsigned integers as Python long integers. Conversion from the database type to Python is done via a string. In FLOAT_DECIMALFORMAT mode (default), mxODBC will fetch the numeric data as Python float. Since Python stores floats as double precision C float, rounding errors may occur during the conversion. In DECIMAL_DECIMALFORMAT mode, mxODBC will fetch the numeric data as string and create a Python decimal.Decimal instance from it which is then returned. This avoids any rounding errors. Python stores floats as double precision C float, so rounding errors may occur during the conversion. The type of the return values depends on the setting of cursor.datetimeformat and whether the ODBC driver/manager does return the value with proper type information. Default is to return DateTime instances. Default is to return DateTimeDelta instances. The Python None singleton is used to represent the special SQL NULL value in Python. mxODBC will try to fetch data from columns using unsupported SQL data types as strings. This is likely to always work but may cause unwanted conversions and or truncations or loss of precision. Output bindings can only be applied using the above mapping by mxODBC if the database correctly identifies the type of the output variables. The SQL type given in the above table is also made available though the cursor's .description tuple as type_code entry (position 1) for result set generating SQL commands. You can compare this value directly to the appropriate SQL object values, e.g. test for SQL.CHAR or SQL.VARCHAR. The last section defined the standard mapping mxODBC applies when fetching output data from the database. The converter function is called for each output column prior to the first .fetch*() operation executed on the cursor. The returned values are then interpreted as defined in the table in section 7.2 Output Conversions and SQL Type Input Binding. identifies the 0-based position of the column in the result set. is usually one of the SQL data type constants, e.g. SQL.CHAR for string data, but could also have database specific values. mxODBC only understands the ones defined in the above table, so this gives you a chance to map user defined types to ones that Python can process. is only used for string data and defines the maximum length of strings that can be read in that column (mxODBC allocates a memory buffer of this size for the data transfer). Returning 0 as sqllen will result in mxODBC dynamically growing the data transfer buffer when fetching the column data. This is sometimes handy in case you want to fetch data that can vary in size. is optional and only needed for some special sqltypes. It will be used in future versions to e.g. allow binding output columns to files which some ODBC drivers support (the column data is transferred directly to a file instead of copied into memory). You can switch converter functions even in between fetches. mxODBC will then reallocate and rebind the column buffers for you. While you should always try to use the above Python types for passing input values to the respective columns, the package will try to automatically convert the types you give into the ones the database expects when using the SQL Type bind method, e.g. an integer literal '123' will be converted into an integer 123 by mxODBC if the database ODBC driver requests an integer. The situation is different in Python type binding mode (BIND_USING_PYTHONTYPE): the Python type used in the parameter is passed directly to the database, thus passing '123' or 123 does make a difference and could result in an error from the database. mxODBC also supports Unicode objects to interface with databases. As more databases and ODBC drivers support Unicode natively, using Unicode for text data stored in database becomes more attractive than ever and allows you to avoid the problems you typically face when having to deal with different text encodings and code pages in databases. Even if you don't have access to an ODBC capable of dealing with Unicode natively, you can still take advantage of the auto-conversion mechanisms in mxODBC to simulate Unicode capabilities. mxODBC provides several different run-time configurations to deal with passing Unicode to and fetching it from an ODBC driver. The .stringformat attribute of connection and cursor objects allows defining how to convert string data into Python objects and vice-versa. Unicode conversions to and from 8-bit strings in Python usually assume the Python default encoding (which is ASCII unless you modify the Python installation). Since the database may be using a different encoding, mxODBC allows defining the encoding to be used on a per-connection basis. The .encoding attribute of connection objects is writeable for this purpose. Its default value is None, meaning that Python's default encoding (usually ASCII) is to be used. You can change the encoding by simply assigning a valid encoding name to the attribute. Make sure that Python supports the encoding (you can test this using the unicode() built-in). The default conversion mechanism used in mxODBC is EIGHTBIT_STRINGFORMAT (Unicode gets converted to 8-bit strings before passing the data to the driver, output is always an 8-bit string), the default encoding Python's default encoding. To store Unicode in a database, one possibility is to use the UNICODE_STRINGFORMAT and set the encoding attribute to e.g. 'utf-8'. mxODBC will then convert the Unicode input data to UTF-8, store this in the database and convert it back to Unicode during fetch operations. Note however that UTF-8 encoded data usually takes up more room in the database than the Unicode equivalent, so may experience data truncations which then cause the decoding process to fail. Another possibility is to use the MIXED_STRINGFORMAT which allows mxODBC to interface to the database using the best suitable data type. For e.g. MS SQL Server this usually means passing all string data as Unicode data to and from the database. In MIXED_STRINGFORMAT mode mxODBC will return string data in the default format of the database driver, leaving the conversion to the Python program. mxODBC only supports Unicode objects at the data storage interface level meaning that it can insert and fetch Unicode data from a database provided that the database can handle Unicode and that the used mxODBC subpackage was configured with Unicode support. It also supports SQL commands given as Unicode data. However, it does not handle Unicode at the schema interface level, that is e.g. cursor.description will not return Unicode objects for the column names. This may be added to a future version of mxODBC, but is currently not supported by the package. The above SQL types are provided by each subpackage in form of SQL type code integers through attributes of the singleton object SQL, e.g. SQL.CHAR is the type integer for a CHAR column. You can decode the type_code value in the cursor.description tuple by comparing it to one of those constants. A reverse mapping of integer codes to code names is provided by the dictionary sqltype which is provided by all subpackages. You may run into problems when using the tuple versions for date/time/timestamp arguments. This is because some databases (notably MySQL) want these arguments to be passed as strings. mxODBC does the conversion internally but tuples turn out as: '(1998,4,6)' which it will refuse to accept. The solution: use DateTime[Delta] instances instead. These convert themselves to ISO dates/times which most databases (including MySQL) do understand. To check the ODBC driver/manager capabilities and support for the above column types, run the included mx/ODBC/Misc/test.py test script. Since many database have problems recognizing some column's or parameter's type beforehand (e.g. for LONGs and date/time values), the Python DB-API provides a set of standard constructors to create objects that can hold special values. When passed to the cursor methods, the module can then detect the proper type of the input parameter and bind it accordingly. In mxODBC these constructors are not needed: it uses the objects defined in mxDateTime for date/time values and is able to pass strings and buffer objects to LONG and normal CHAR columns without problems. You only need them to write code that is portable across database interfaces. A Cursor Object's description attribute returns information about each of the result columns of a query. The type_code compares equal to one of Type Objects defined below. Type Objects may be equal to more than one type code (e.g. DATETIME could be equal to the type codes for date, time and timestamp columns). mxODBC returns more detailed description about type codes in the description attribute. See the section 7 Supported Data Types for details. The type objects are only defined for compatibility with the DB API standard and other database interfaces. This function constructs an mxDateTime DateTime object holding the given date value. The time is set to 0:00:00. This function constructs an mxDateTime DateTimeDelta object holding the given time value. This function constructs an mxDateTime DateTime object holding a time stamp value. This function constructs an mxDateTime DateTime object holding the date value from the given ticks value (number of seconds since the epoch; see the documentation of the standard Python timemodule for details). Usage of Unix ticks (number of seconds since the Epoch) for date/time database interfacing can cause troubles because of the limited date range they cover. This function constructs an mxDateTime DateTimeDelta object holding a time value from the given ticks value (number of seconds since the epoch; see the documentation of the standard Python timemodule for details). This function constructs an mxDateTime DateTime object holding a time stamp value from the given ticks value (number of seconds since the epoch; see the documentation of the standard Python time module for details). This function constructs a buffer object pointing to the (long) string value. On Python versions without buffer objects (prior to 1.5.2), the string is taken as is. This type object is used to describe columns in a database that are string-based: SQL.CHAR, SQL.BINARY. This type object is used to describe (long) binary columns in a database: SQL.LONGVARCHAR, SQL.LONGVARBINARY (e.g. LONG, RAW, BLOB, TEXT). This type object is used to describe numeric columns in a database: SQL.DECIMAL, SQL.NUMERIC, SQL.DOUBLE, SQL.FLOAT, SQL.REAL, SQL.DOUBLE, SQL.INTEGER, SQL.TINYINT, SQL.SMALLINT, SQL.BIT, SQL.BIGINT. This type object is used to describe date/time columns in a database: SQL.DATE, SQL.TIME, SQL.TIMESTAMP. This type object is used to describe the "Row ID" column in a database. mxODBC does not support this special column type and thus no type code is equal to this type object. SQL NULL values are represented by the Python Nonesingleton on input and output. The mxODBC package and all its subpackages use the DB API 2.0 exceptions layout. All exceptions are defined in the submodule mx.ODBC.Error but also imported into the top-level package module mx.ODBC as well as all sub-packages. Note that all sub-packages use the same exception classes, so writing cross-database applications is simplified this way. SQL state (sqlstate) and type (sqltype) are defined by the ODBC standard and may be extended by the specific ODBC driver handling the connection. Please see the ODBC driver manual for details. lineno refers to the line number in the mxODBC.c file to ease debugging the package. The reason is that the Errorbase class is imported into the top-level mx.ODBCpackage when loading it, shadowing the module of the same name. With the above form, Python will lookup mx.ODBC.Error in the module dictionary instead of the mx.ODBCpackage and find the module instead of the mx.ODBC.Error exception class. These exceptions are defined in the modules scope and also available as attributes of the connection objects to easy writing applications using different mxODBC sub-packages. If you are interested in the exact mapping of SQL error codes to exception classes, have a look at the mxODBC_ErrorCodeTranslations array defined in the mxODBC source code (mxODBC.c) or inspect the errorclass dictionary which is defined at subpackage scope. If you need to specify your own SQLSTATE to exception mappings, you can assign to the errorclass dictionary. It maps SQLSTATE strings to error classes and is used by mxODBC internally. The default behavior of mxODBC is to raise all errors, including Warnings, which many ODBC drivers issue for truncations, loss of precision in data conversions, etc. All ODBC driver generated exceptions use a standard exception value layout. SQL state as string; these values are defined in the ODBC Documentation and by the ODBC driver/manager. Numeric SQL error code as integer; these values are defined in the ODBC Documentation and by the ODBC driver/manager. Message text as string explaining the error. These strings usually have the format "[Vendor][Driver][Database] Message Text". Line number in the mxODBC.c source code which generated the message. This is very useful for support purposes. If you want to provide your own error handler, e.g. to mask database warnings, you can do so by assigning to the .errorhandler attribute of connections and cursors or passing a callback function to the connection constructors at connection creation time using the errorhandlerkeyword argument. Error handlers are inherited from connections to cursors, so it normally suffices to set an error handler on the connection object to have it take affect for all subsequently created cursors. Cursors created prior to setting the error handler on the connection will not see or use the new error handler. An error handler has to be a callable object taking the arguments (connection, cursor, errorclass, errorvalue) where connection is a reference to the connection, cursor a reference to the cursor (or None in case the error does not apply to a cursor), errorclass is an error class which to instantiate using errorvalue as construction argument. The default handler will append the tuple (errorclass, errorvalue) to the .messages list of the cursor or connection (if cursor is None) and then raise the exception by instantiating errorclass with errorvalue. Note that only database and ODBC driver/manager related errors are processed through the error handlers. Other errors such as mxODBC internal or AttributeErrors are not processed by these handlers. Here's an example of an error handler that allows to flexibly ignore warnings or only record messages.
""" Default mxODBC error handler. In case the connection or one of the cursors created from it cause an error, mxODBC will call the myerrorhandler() function to let it decide what to do about the error situation. Possible error resolutions are to raise an exception, log the error in some way, ignore it or to apply a work-around. Typical use-cases for error handlers are situations where warnings need to be masked or an application requires an on-demand reconnect. mxODBC includes a few helper functions and generic APIs which aid in everyday ODBC database programming or allow introspection at the ODBC manager level. The next sections describe these functions in detail. For some subpackages, mxODBC also defines a few helpers which you can use to query additional information from the ODBC driver or manager. These are available through the subpackage, e.g. as mx.ODBC.Windows.DataSources(). This helper function is only available for ODBC managers and some ODBC drivers which have internal ODBC manager support, e.g. IBM's DB2 ODBC driver, and allows you to query the available data sources. Older versions of unixODBC had a bug in some versions which makes the manager only return information about data sources on the first call to this function. Older versions of iODBC truncated the descriptions to two characters. Returns the given ODBC environment option. This method interfaces directly to the ODBC function SQLGetEnvAttr(). option must be an integer. Suitable option values are available through the SQL singleton object. This function is only available for ODBC 3.x compatible managers and ODBC drivers. This function lets you set ODBC environment attributes which are encoded as 32-bit integers. This method interfaces directly to the ODBC function SQLSetEnvAttr(). The function allows setting environment attributes which mxODBC itself uses to define the way it interfaces to the database. Changing these attributes can result in unwanted behavior or even segmentation faults. USE AT YOUR OWN RISK ! Returns a tuple (connections, cursors) stating the number currently open connections and cursors for this subpackage. Note that broken connections or cursors are not correctly counted. headers may be given as list of strings. It defaults to the header names from cursor.description. The function will add numbered columns as appropriate if it finds more columns than given in headers. Columns are separated by colsep; the header is separated from the result set by a line of headersep characters. The function calls stringify to format the value data returned by the driver into a string. It defaults to repr(). Pretty-prints the current result set available through cursor. See format_resultset() for details on formatting. Singleton object which defines nearly all values available in the ODBC 3.5 header files. The "SQL_" part of the ODBC symbols is omitted, e.g. SQL_AUTOCOMMIT is available as SQL.AUTOCOMMIT. Writeable dictionary mapping SQL error code strings (ODBC's SQLSTATE) to exception objects used by the module. If you need to specify your own SQLSTATE to exception class mappings, you can assign to this dictionary. Changes will become visible immediately. Dictionary mapping SQL type codes (these are returned in the type field of cursor.description) to type strings. All natively supported SQL type codes are included in this dictionary. The contents may vary depending on whether the ODBC driver/manager defines these types or not. ODBC 2.0 type code integers for the various natively supported SQL types. These map to integers as returned in the type field of cursor.description. They are also available through the SQL singleton, e.g. SQL.CHAR. The dictionary sqltypeprovides the inverse mapping. The codes mentioned in square brackets are optional and only available if the ODBC driver/manager supports a later ODBC version than 2.5. Note that mxODBC has support for unknown SQL types: it returns these types converted to strings. The conversion is done by the ODBC driver and may be driver dependent. Integer constant stating the level of thread safety the interface supports. It is always set to 1, meaning that each thread must use its own connection. String constant stating the supported DB API level. This is set to '2.0', since mxODBC supports nearly all features of the DB API 2.0 standard. Many DB API 1.0 features are still supported too for backward compatibility. String constant stating the type of parameter marker formatting expected by the interface. This is set to 'qmark', since ODBC interfaces always expect '?' to be used as positional placeholder for variables in an SQL statement. Parameters are bound to these placeholders in the order they appear in the SQL statement, e.g. the first parameter is bound to the first question mark, the second to the second and so on. Integer values returned by connection.bindmethod. SQL type binding means that the interface queries the database to find out which conversion to apply and which input type to expect, while Python type binding looks at the parameters you pass to the methods to find out the type information and then lets the database apply any conversions. The bind method is usually set at compilation time, but can also differ from database to database when accessing them via an ODBC manager. Integer values which are used by connection.datetimeformat and cursor.datetimeformat. mxODBC can handle different output formats for date/time values on a per connection and per cursor basis. See the documentation of the two attributes for more information. Integer values which are used by connection.stringformat and cursor.stringformat. mxODBC can handle different string conversion methods on a per connection and per cursor basis. See the documentation of the two attributes for more information. Integer values which are used by connection.decimalformat and cursor.decimalformat. mxODBC can handle different output formats for numeric and decimal database column types on a per connection and per cursor basis. See the documentation of the two attributes for more information. Integer flag which is either 0 or 1 depending on whether mxODBC was compiled with Unicode support or not. Unicode support is available in Python 2.0 and above and enabled per default. String with the license information for the installed mxODBC license. Exception objects used by the mxODBC subpackages. See section 9. mxODBC Exceptions and Error Handling for details. This section includes specific notes for preconfigured subpackages and setups. The following sections provide hints that apply to all mx.ODBC sub-packages. Please read carefully. You should always use the mx.ODBC.Windows subpackage and access the databases through the MS ODBC Driver Manager. The other packages provide Unix based interfaces to the databases. Even though there are many subpackages for specific databases which then sometimes provide more functionality for that particular database, we would like to encourage the use of ODBC managers such as the iODBC or unixODBC managers, since these provide the best flexibility in terms of database setup and configuration. Using ODBC managers also enables you to easily switch from local databases to cross-network databases by adding additional tiers in-between. The binary distributions of mxODBC for Unix platforms usually only contain the mx.ODBC.unixODBC and mx.ODBC.iODBC subpackages. When compiling the package from source, you should always check the paths and filenames used in the corresponding section of the distribution's mxODBC.py file because these depend on your specific ODBC driver/manager installations. You may also want to consult Paul Boddie's mxODBC Configuration page which has some details about specific database backends he has used with mxODBC. mxODBC compiles on Windows using VC++ and links against the Windows ODBC driver manager. The necessary import libs and header files are included in the VC++ package but are also available for free in the Microsoft ODBC SDK (now called MDAC SDK). Note that the latter is usually more up-to-date. Always use the DriverConnect() API to connect to the data source if you need to pass in extra configuration information such as names of log files, etc. The subpackage defaults to SQL type binding mode (see the Datatypes section for details), but reverts to Python type binding in case the connection does not support the SQLDescribeParam() API. MS Access is one candidate for which this API is not useable. If you have troubles with multiple cursors on connections to MS SQL Server the MS Knowledge Base Article 140896 INF: Multiple Active Microsoft SQL Server Statements has some valuable information for you. (thanks to Damien Morton for tracking this down and digging up the MS KB article). More information about the MS SQL Server ODBC Driver and the various connection parameters and options are available on the MSDN Library site: MS SQL Server ODBC Driver Programmer's Guide. If you are experiencing problems related to access violations, like e.g. a possible reason could be that you are using a function or stored procedure which is generating output using PRINT or that it uses RAISEERROR to report an error with the parameters or values. Another possible reason is that the ODBC driver for SQL Server does not support the syntax you are using or that bound parameters are not allowed at that location in the SQL statement. As work-around you can use Python string formatting to insert the data verbatim directly into the SQL statement. This is a problem related to the used transaction manager rather than mxODBC or the database. Please consult your DBA for help. Note that even though the above exception is raised by the cursor.execute() method, the fact that it is a warning suggests that the executed operation was indeed executed on the cursor. A general description of the problems you might experience when accessing the MS SQL Server using ODBC is described in the article Using ODBC with Microsoft SQL Server. Even though it's dated September 1997 it provides some insights into the design and workings of the MS SQL ODBC driver. This is sometimes useful when you want to dynamically setup a data source, e.g. a MS Access database. For more information about the FILEDSN-keyword and the other Windows ODBC manager features, see the Microsoft SQLDriverConnect() documentation. Also note that ODBC drivers working on single files, e.g. the MS Excel file driver, usually do not support transactions. mxODBC will not clear auto-commit for these drivers (it may sometimes still be necessary to set the clear_auto_commit flag in the connect constructors to 0). iODBC is an Open Source ODBC manager for Unix maintained by OpenLink. It compiles against mxODBC without problems and is the preferred way of talking to an ODBC data source from Unix using mxODBC. ● Always use the DriverConnect() API to connect to the data source if you need to pass in extra configuration information such as names of log files, etc. ● Note:When interfacing to MySQL using the MySQL ODBC driver, we have observed problems with using Unicode statements passed to cursor.execute() when using iODBC 3.52.5. These problems appear to be related to iODBC. As work-around, you can use unixODBC, which works fine with Unicode statements. unixODBC is an alternative Open Source ODBC manager for originally designed for Linux and later extended to other Unixes maintained by EasySoft. It compiles against mxODBC without problems. ● Even though unixODBC does support Unicode data to some extent, there are bugs in unixODBC <= 2.0.7 which will result in random core dumps due to memory being overwritten during the conversion of 8-bit to Unicode data. Later versions of unixODBC may not have this problem, so you should check by running the mx.ODBC.Misc.test script in continuous mode against your version. The following subpackages are specific to certain ODBC drivers against which mxODBC can be linked directly. If possible, please use one of the above ODBC managers for connecting to databases, since these often reduce the number of problems you can run into when setting up an ODBC connection. Note binary distributions of mxODBC usually don't contain any additional subpackages for specific drivers. Only the ODBC manager packages for the platform are included. However, driver specific subpackages can be made available on request. Please write to support@egenix.com for details. The SuSE Linux distribution ships with a free personal edition of Adabas (available in form of RPMs from SuSE). A commercial version is also available, but we suggest first trying the personal edition. The ADABAS ODBC driver returns microseconds in the timestamp fraction field. Because of this the Setup includes a define to do the conversion to seconds using a microseconds scale instead of the ODBC standard nanosecond scale. Since the ODBC driver for Adabas on Linux also provides the DriverConnect() API it is also exposed by the package (even though the driver itself is not an ODBC manager). IBM provides a free express edition of the powerful DB2 database engine which happens to use ODBC as native C level interface. This package interfaces directly to the ODBC driver included in the Unix edition of the database. If you want to access DB2 from Windows NT, you can use the Windows subpackage of mxODBC. There is one catch you should watch out for: in order to connect to the IBM DB2 database the DB2INSTANCE environment variable must be set to the name of the DB2 instance you would like to connect to. Also note that DB2 needs to be explicitly told that you want to connect to the database using ODBC. This is done by binding the IBM CLI driver against the database. Please consult the IBM DB2 documentation for details. If you want to use the DriverConnect() API, you'll have to configure the IBM ODBC driver's data source INI file which is named db2cli.ini and usually found in the same directory as the above script files. DBMaker has a small lean and mean SQL database that comes with an ODBC driver. This subpackage interfaces directly to that ODBC driver. DBMaker's ODBC driver doesn't have all the advertised SQL catalog functions (the privilege functions are missing) and also doesn't support the .nativesql() method. It does provide a DriverConnect() API, which might be useful for connecting to databases across a network. mxODBC currently does not support the use of file object for in- and output of large objects. This may change in a future version though (the needed techniques are already in place). The subpackage links against the DBMaker driver without problems. Testing has only been preliminary though, but since even CASEMaker advertises mxODBC as Python interface for DBMaker, you should be on the safe side. EasySoft has developed an ODBC-ODBC bridge which allows you to connect to any remote ODBC driver, e.g. you can access MS SQL Server running on an NT box from your Linux web-server. You can download it via the product page or via FTP as trial version. The personal editions are said to available for free in the near future. Remember to download setups for client (Linux in the example) and server (NT in the example). The FreeTDS ODBC driver implements the client side of the TDS wire protocol used by Sybase ASA and Microsoft SQL Server installations. It allows you to directly connect to a SQL Server database from a Unix machine. mxODBC compiles against the current FreeTDS release available from the www.FreeTDS.org site, but since the driver is not fully developed yet, only very basic operations are supported. ● The FreeTDS website mentions that the driver has some restrictions. There are other ODBC drivers available from commercial vendors which implement the full ODBC3 API, e.g. from OpenLink and Data-Direct, which work well with mxODBC. Note that the libtdsodbc.so file may be located in a different directory on your machine. Informix for Unix doesn't come with Unix ODBC drivers, but there a few source for these: Informix sells the driver under the term "Informix CLI"; Data-Direct and OpenLink also support Informix through their driver suites. Note: There is also a free Informix SDK available for a few commercial Unix platforms like HP-UX and Solaris. It includes the needed ODBC libs and header files (named infxcli.h and libifsql.a). Once you have installed the ODBC drivers following the vendor's instructions, enable the appropriate set of directives in Setup, run make -f Makefile.pre.in boot in the Informix/ subdirectory, and then run make to finish the compilation. To use the OpenLink driver setup instead copy Setup.in to Setupand enable the OpenLink section in Setup before compiling. In addition to the change to Setup (or Setup.in) file edition before the "make -f Makefile.pre.in boot", I made it compile and run with the following changes in the Informix section of the "Setup" file (according to the latest "Informix ODBC Driver Programmer's Manual"). Note that this book must be read carefully for the setup of the Informix related environment variables: The user must have $INFORMIXDIR (informix client software root) set. and his LD_LIBRARY_PATH must include "$INFORMIXDIR/lib:$INFORMIXDIR/lib/esql:$INFORMIXDIR/lib/cli"
Compiling mxODBC requires Informix client SDK (compile time free download from intraware.com) and ESQL/C libraries (client run-time libraries provided with the server CD - not free). In addition, fixes and tuning must be done in $INFORMIXDIR/etc/odbcinst.ini, and the user must configure his data sources in $HOME/.odbc.ini or $ODBCINI file. MySQL is a SQL database for Unix and Windows platforms developed by TCX. It is free for most types of usage (see their FAQ for details) and offers good performance and stability. To download MySQL and the ODBC driver MyODBC, check the www.mysql.com website. There is one particularity with the ODBC driver for MySQL: all input parameters are being processed as string -- even integers and floats. The ODBC driver implements the necessary conversions. mxODBC uses the Python Type binding method to bind the input parameters; see the Python Type Input Binding section 7.3 for more details. Depending on your MySQL setup (whether you use a transactional storage backend or not), clearing the auto-commit flag at connection time, which is normally done per default by the connection constructors, will not work. The subpackage uses auto-commit mode as default. You can turn this workaround off by editing the distribution's setup.py and removing the switch DONT_CLEAR_AUTOCOMMIT e.g. if you are using a MySQL 4.x or 5.x version with transactions enabled. When using the MyODBC RPMs available from www.mysql.com, please be sure to also have the MySQL shared libs RPM and the MySQL development RPM installed. Some MySQL + MyODBC setups we have tested showed some serious memory leaks on Linux machines; please check your setup using the included mx/ODBC/Misc/test.py script for leaks. There are no known leaks in mxODBC itself. Oracle for Unix doesn't ship with Unix ODBC drivers. You can get them from Data-Direct or OpenLink. Once you have installed the ODBC drivers following the vendor's instructions, run make -f Makefile.pre.in boot in the Oracle/subdirectory, enable the appropriate set of directives in Setup and then run make to finish the compilation. Once you talk to the Data-Direct ODBC driver, it seems to be a simple matter of setting up the ODBC data source name in their .ini file that has that stuff. At that point you can talk to any of their ODBC drivers you have installed. To use the OpenLink driver setup instead, copy Setup.in to Setupand enable the OpenLink section in Setup before compiling. Tested with PostgreSQL 8.2.3 and the psqlodbc driver 08.02.0200. PostgreSQL is a free SQL database for Unix. This subpackage is for linking directly against the PostgreSQL ODBC driver on Unix. An alternative setup would be connecting to the database via one of the Unix ODBC managers iODBC or unixODBC also supported by mxODBC. Because of deficiencies in the PostgreSQL ODBC drivers, the package operates in Python type binding mode. The ODBC driver still has serious problems with data conversion, e.g. it doesn't properly quote binary data and has problems dealing with large objects (BLOBs). It does support smaller strings, numbers and date/time values. Note: Connecting to a PostgreSQL database from Windows using the PostgreSQL Windows ODBC Driver through the Windows ODBC Manager was reported to work fine. SAP DB is a free Open Source, high-performance and fully SQL-92 compliant database made available by SAP which originated from a branch of Adabas D. There are binary versions available for all major platforms and all come with ODBC drivers. This subpackage is preconfigured to link against the Linux version of the ODBC driver. Since the ODBC driver for SAP DB also provides the DriverConnect() API it is also exposed by the package (even though the driver itself is not an ODBC manager). MaxDB, the successor to SAPDB is also support by mxODBC. You can use the mx.ODBC.SAPDB package to connect to the MaxDB ODBC driver or one of the ODBC manager packages available in mxODBC. Solid Tech. offers an embedded database engine for many different platforms. More information about prices, licenses and downloads is available on their website. The Solid Server's low-level database API uses ODBC as interface standard (most other vendors have proprietary interfaces), so mxODBC should deliver the best performance possible. Note that Unicode with Solid only works if you link directly against the driver. Accessing Solid through an ODBC manager such as unixODBC or iODBC currently mangles the data because Solid uses 4 bytes to store a character while the ODBC managers use 2. The Solid ODBC driver only supports scrolling in increments of 1. mxODBC tries to emulate most other modes, but not all work, e.g. you can't scroll out of the result and then back in again. Sybase Adaptive Server Anywhere comes with its own ODBC driver against which mxODBC can link directly. The included Setup is for version 7 of the server. In case you are running Linux, Sybase has some information on its web-site about the ASA ODBC driver and its setup on Linux. This whitepaper should also be of interest. You can also use the OpenLink drivers for Sybase ASA: copy Setup.in to Setupand enable the OpenLink section in Setup before compiling. In any case, you should also consult Paul Boddie's mxODBC Configuration page for the Sybase Adaptive Server Anywhere. It includes valuable information about the setup. Thanks to Paul Boddie and Sam Rushing for helping in getting the package together. Note that you will first have to get the Sybase ASE ODBC drivers from Data-Direct (formerly Merant) in order to use this subpackage -- Sybase ASE does not include ODBC drivers (it's a completely different product than Sybase ASA). This whitepaper has some details about ODBC connectivity of ASE. Gary Pennington from Sun Microsystems reported that the Data-Direct (formerly Merant) evaluation drivers work with Sybase Adaptive Server 11.5 on Solaris 2.6. You can also use the OpenLink drivers for Sybase ASE: copy Setup.in to Setupand enable the OpenLink section in Setup before compiling. In any case, you should also consult Paul Boddie's mxODBC Configuration page for the Sybase Adaptive Server Enterprise version. It includes valuable information about the setup. ODBC drivers and managers are usually compiled as a shared library. When running CGI scripts most HTTP daemons (or web servers) don't pass through the path for the dynamic loader (e.g. LD_LIBRARY_PATH) to the script, thus importing the mxODBC C extension will fail with unresolved symbols because the loader doesn't find the ODBC driver/manager's libs. To have the loader find the path to those shared libs you can either wrap the Python script with a shell script that sets the path according to your system configuration or tell the HTTP daemon to set or pass these through (see the daemon's documentation for information on how to do this; for Apache the directives are named SetEnvand PassEnv). Thomas Heller has written a great tool which is based on distutils. The tool allows you to freeze your application into a single standalone Windows application and is called py2exe. Freezing mxODBC together with an application and redistributing the resulting executables requires that you have obtained developer licenses from eGenix.com permitting you to redistribute mxODBC along with a product. Please see the License section for more information. After doing so, py2exe should have no problem finding the files mxODBC.pyd and mxDateTime.pyd needed by mx.ODBC.Windows and mx.DateTime. mxODBC also uses the md5 or hashlibmodule (depending on the Python version) and the license module mx.ODBC.license internally. You will have to add them to the above list, if you run into license verification problems when running the py2exe compiled application. Here is a very simple example of how to use mxODBC. More elaborate examples of using Python Database API compatible database interfaces can be found in the Database Topic Guide on http://www.python.org/. Andrew Kuchling's introduction to the Python Database API is an especially good reading. There are also a few books on using Python DB API compatible interfaces, some of them cover mxODBC explicitly. As you can see, mxODBC has the same interface on Unix and Windows which makes it an ideal basis for writing cross-platform database applications. When connecting to a database with transaction support, you should explicitly do a .rollback() or .commit() prior to closing the connection. In the example this was omitted since the database backend MySQL does not support transactions. The package includes a test script that checks some of the database's features. As side effect this also provides a good regression test for the mxODBC interface. To start the test, simply run the script in mx/ODBC/Misc/test.py. The script will generate a few temporary tables (named mxODBC0001, mxODBC0002, etc; no existing tables will be overwritten) and then test the interface - database communication including many database related features such as data types and support of various SQL dialects. The tables are automatically removed after the tests have run through. Entries enclosed in brackets are packages (i.e. they are directories that include a __init__.py file). Ones with slashes are just simple subdirectories that are not accessible via import. Note that this was changed in mxODBC 3.0. Previously the catalog methods used to return the number of rows in the result set.